Earlier this year, in response to a call for submissions, I wrote “Eromenoi Herakleos,” a short story about the Greek hero Hercules. A classics professor at Virginia Tech helped me with the title: it’s Greek for “Hercules’ boyfriends.” In such relationships in classical Greece, the eromenos (“the beloved”) was the younger partner and the erastes (“the lover”) was the older partner. Here’s the epigraph for the story: “Plutarch…maintains in his Eroticos that Heracles’ homosexual affairs were so numerous that it is impossible to list them all.” This quotation comes from Bernard Sergent’s Homosexuality in Greek Myth. In my story, Hercules ravishes several youths: Iolaus, Hylas, and Philoctetes. 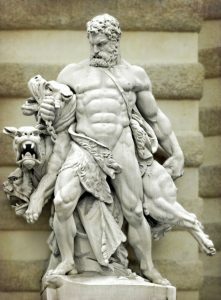 Hercules had a complex and contradictory personality I can well relate to: selfish, hot-tempered, brash, loyal, lusty, grappling with extreme pride and gnawing shame. I enjoyed doing the research, reading Hercules (Myths and Legends) by Fred Van Lente and Homosexuality in Greek Myth by Bernard Sergent. I also reread sections of Lovers’ Legends: The Gay Greek Myths by Andrew Calimach. The story will be included in Friends of Hyakinthos, edited by Steve Berman, due out in 2017. Two of my favorite things: Greek mythology and Jeff Mann!